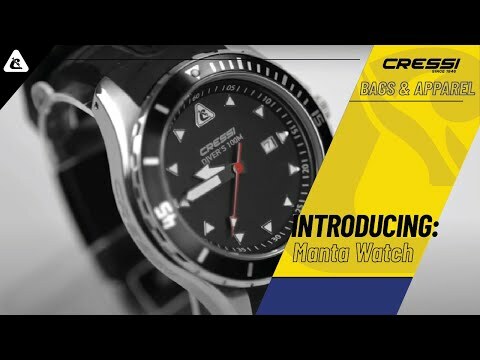 A true diver’s watch, the Cressi Manta is a high-quality timepiece built to withstand the rigors of saltwater environments, and its clean lines make a classic diving fashion statement. Depth rated to 330 feet, it features a strong stainless steel case, scratch-resistant crystal glass face and extra-large rubber strap. Stainless steel case, crystal glass face and waterproof crown combine to withstand pressures to 10 ATM (330 feet). Proven Quartz mechanism for precision timekeeping. Unidirectional bezel clearly marked for tracking dive time. Fluorescent hour/minute/second hands are easy to read in low-light conditions. Date indicator at number 3 position on the dial. Stainless steel pins used for strap adjustments. Extra-large rubber strap accommodates exposure suits.